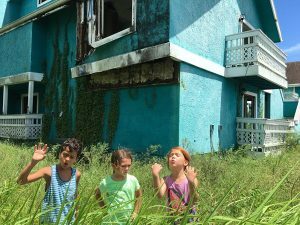 The Florida Project journeys through the day-to-day life of a wide-eyed, funny and precocious six-year-old girl and her ragtag group of friends. Monee and her rebellious mother Halley live at “The Magic Castle,” a budget motel, overseen by Bobby, the stern-faced but kindly manager. Despite this harsh environment, Monee gets up to mischief and adventure and her summer break is filled with a sense of wonder and possibility while the adults around them struggle with the realities of life. Brooklyn Prince gives an exceptional performance as the young Monee.